Jewelrecycle address, phone, website, and more. 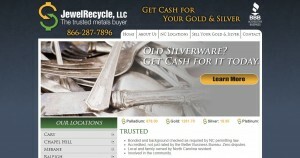 JewelRecycle is a great place to sell your gold and silver, face-to-face with our specialists! 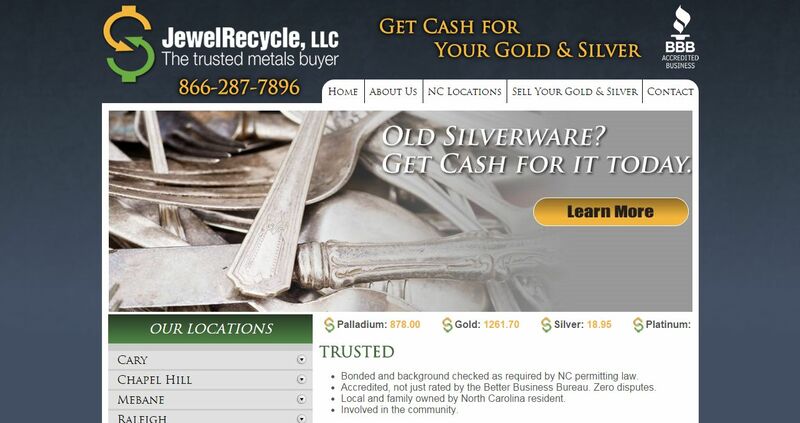 Whether you live in or near Raleigh, Chapel Hill, Mebane, Cary or Wilmington, JewelRecycle is always a safe and convenient way to sell your items in our friendly, zero pressure environment approach. Since 2009, JewelRecycle has established itself as a fair and honest gold buyer operating stores throughout North Carolina. We specialize in buying jewelry, watches, coins, bullion, sterling flatware, hollowware, and more. Only JewelRecycle provides “Certified Top Dollar” payouts. This means that we have surveyed local jewelry stores, pawn brokers, coin shops, and roaming gold buyers, and we certify that we pay more! We establish our higher payout pricing based on current conditions, and will beat any other licensed and permitted buyer in the state.